Fernando Alonso’s new McLaren position has the potential to trigger a problem later down the line. With McLaren announcing Fernando Alonso as its test driver for the next two years while on top at pre-season Formula 1 testing, a new dilemma in its rebuilding phase has been laid which could trigger major headaches later down the line. The two-time F1 world champion was always expected to stay part of the McLaren fold following his retirement from the sport at the end of last season, not only through his Indianapolis 500 entry, with the scope of his involvement being finalised over the winter. Alonso takes up the ambassador role, one also held by Mika Hakkinen, but unlike the Finn his recent retirement won’t constrain him to fondly looking back to the glory days he’s enjoyed at the Woking-based team. He’s been given licence to push his influence on the current team both behind the scenes and on track. As well as selected test outings planned for 2019 and 2020, Alonso revealed he will act as translator between drivers and engineers by using his 18 years of experience in F1 to help maximise the development of McLaren’s car. 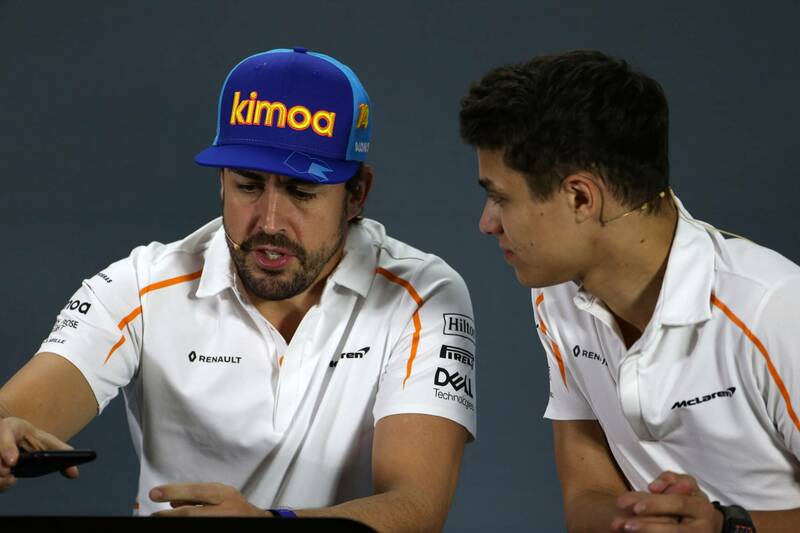 This is no part-time gig for the Spaniard, who is determined to play a role at every race and test – via video calls or in person – and give his guidance to McLaren as well as Carlos Sainz and Lando Norris. “After 18 years, I probably know most of the circuits, most of the tricks here and there and hopefully help, especially with Lando being in his first year, on anything that may appear on a grand prix weekend,” Alonso said. “Having a driver behind the engineers probably helps. They only see the telemetry, they analyse and make decisions looking at the telemetry. “I can be the link of what they see on the data and to what the driver is feeling or what the message the driver is passing through the radio. Hopefully I can help as much as I can. “I will try to be present at the circuit as much as I can. The first half of the season is going to be very busy for me so it is going to be difficult to attend but maybe in the second part of the year, depending on my programme for the rest of the season and 2020 maybe I will have more time. McLaren’s progress has been promising at pre-season testing as it looks to right the wrongs from last season with Alonso admitting the team’s design philosophy was flawed last year. “This car we are running today was born in June last year when we identified our problems, our weaknesses, our philosophies that were wrong with the 2018 car and we started discussing and having meetings plus simulator work for the 2019 car,” he explained. “Now, the 2019 car is a reality and it is running on track. 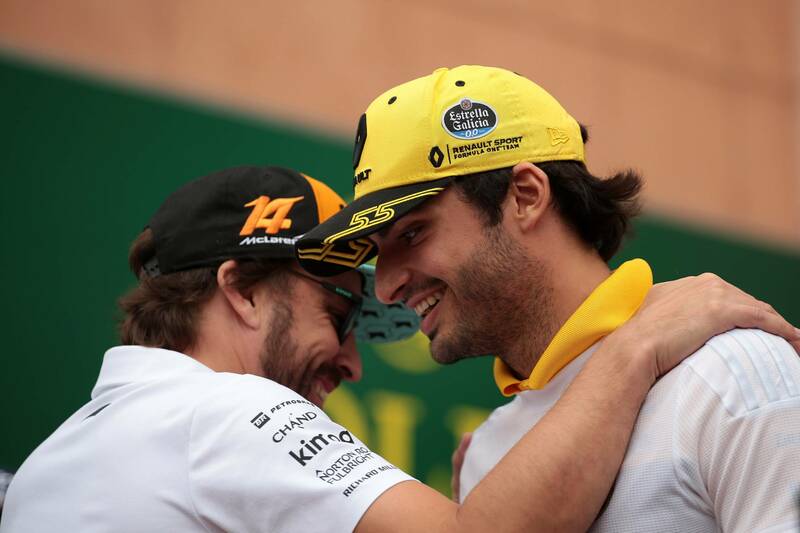 It also appears its refreshed driver line-up is fully welcoming of having the two-time F1 world champion to lean upon in their new surroundings – Sainz going as far as to say he’d sacrifice an in-season test to gain Alonso’s feedback. “I think I have enough experience to not do an in-season test and give it to Fernando,” Sainz said. “I’m not so worried about that. Alonso’s hunger for success has never been questioned, just look at what he’s been up to since retiring from F1 by winning the Daytona 24 Hours and preparing for both the remainder of the World Endurance Championship with Toyota and his own return to the Indy 500, but his desire to fight from the back of the F1 grid – often single-handedly – had become too much of a frustration with four years of pain since his return to McLaren. Since announcing his retirement, Alonso frequently teased a possible F1 return on the basis he could secure a competitive package and he didn’t miss the opportunity to wheel out the sentiment again following today’s announcement. Time will tell if he is serious on that point, but that question could be answered by how McLaren performs over the next 12 to 18 months. Almost all F1 pre-season testing results are taken with caution and any predictions are made with an asterisk next to them. Alonso forecasted podiums for McLaren this time last year but the best it would get was fifth place in Australia which was aided by Valtteri Bottas starting down in 15th for Mercedes and both Haas cars dropping out of the race ahead of him. In reality, McLaren will be in the thick of the midfield fight at the start of this season and will have to grab any opportunity handed to them by other teams to break on to the podium in 2019. But stranger things have happened and it would be Alonso’s luck that McLaren returns to the rostrum the year he steps away after four barren campaigns. But this is where McLaren could create its own dilemma if the “pieces of the puzzle” all come together. With all those elements working in harmony, McLaren would be a force to be reckoned with and become an attractive proposition for Alonso. But where would that leave Norris and Sainz? Both McLaren’s new drivers have signed multi-year agreements, believed to two-year deals, but with the Woking-based squad investing in its future, would it turn its back on one of them to give Alonso a shot? Naturally, if either underperforms and underdelivers that would provide justification to axing one of them, but if the team is successful enough to entice Alonso back to F1, it seems unlikely that would be achieved through poor results. In short, if both produce the desired performances and McLaren can fight at the front – pretty big ifs – one would have to make room for the two-time F1 world champion. These hypothetical questions have duly been batted away by McLaren chief Zak Brown who would no doubt welcome that dilemma rather than another period of poor results. “We haven’t discussed it,” Brown said. “So, we will cross any bridge when we come to it but we’ve got our two drivers and we are very happy with them. There’s no doubting Alonso would jump at the chance of a competitive return to F1 but as he has said he’s only interested in taking on challenges where he has a realistic chance of winning. This is what the question ultimately comes down to: if McLaren can manufacturer a front-running package in the near future, will it create a new dilemma of cutting short its future to grasp a shot at redemption from its recent past? With time the answer will become clearer but if all of Alonso’s wishes come true the friendly trio of McLaren drivers could turn into a tricky three-into-two situation.